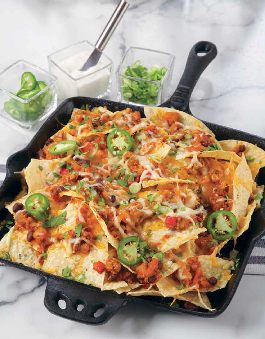 Loaded nachos—with fried tortilla chips and mounds of cheese sauce, sour cream and ground beef—are an all-time favourite. They may be delicious, but a platter can contain over 2000 calories and 100 grams of fat! Try my tasty and healthier version that uses lean ground turkey and a variety of fresh toppings. 1. Preheat the oven to 450°F. Spray a 10- or 12-inch pizza pan or large oven-proof platter with vegetable oil. 2. Lightly spray a large skillet with vegetable oil. Set skillet over medium heat and add oil. Add onions and garlic and sauté for about 5 minutes, until softened. If using ground turkey, add and sauté until no longer pink, about 5 minutes. Add red pepper and sauté for 2 minutes, until softened. Stir in chili powder, black beans, tomato sauce, and salt and pepper. Simmer, uncovered, for 10 minutes, stirring occasionally, until mixture has thickened. If using leftover turkey, add now. 3. Spread half of the tortilla chips evenly over the prepared pan. Pour half of the turkey mixture evenly over top and sprinkle with half of the cheese. Repeat with the remaining chips, turkey mixture and cheese. Bake in the preheated oven for 5 minutes or until the cheese melts and tortillas crisp. Garnish with your choice of toppings (if using) and serve immediately.